What do we mean by muscle power? Mechanical power can be defined as the rate of work or the force multiplied by the velocity of movement. Therefore, in order to become more powerful, we must address both parts of this equation. You can already probably see if you read the previous post on training muscle strength (HERE) how training for power is going to be different than training for strength. Muscle power is important for activities such as throwing, jumping, kicking, where you need to produce muscle force very quickly. However, think also about injury…. What If you stumble off a curb, or unexpectedly land on someone’s foot after a jump…? What stops you from becoming injured? What enables you to correct your joint or body position? Yes! You need to produce force very quickly. Thus you see, muscle power is really important for injury prevention too. When we talk about muscle power, we often refer to the rate of force development (RFD). The quicker we can get our muscles to contract and produce force (the rate), in theory the more powerful we can become. You can focus your training to maximise the increase the rate of force development, or speed of muscle force generation, without changing how strong you are. Okay, we could get pretty deep here. We could talk about the discussion in the literature regarding whether to use heavy or light weights, and we could talk about the application and athlete needs, however, let’s save that level of detail for another time and get some basics in place so you can get started. Clearly, there are many ways to train power, including resistance training focussing on a single body part. And if you’re really serious about maximising muscle power a periodised, progressive programme should be followed. However, the above is a good starting point. 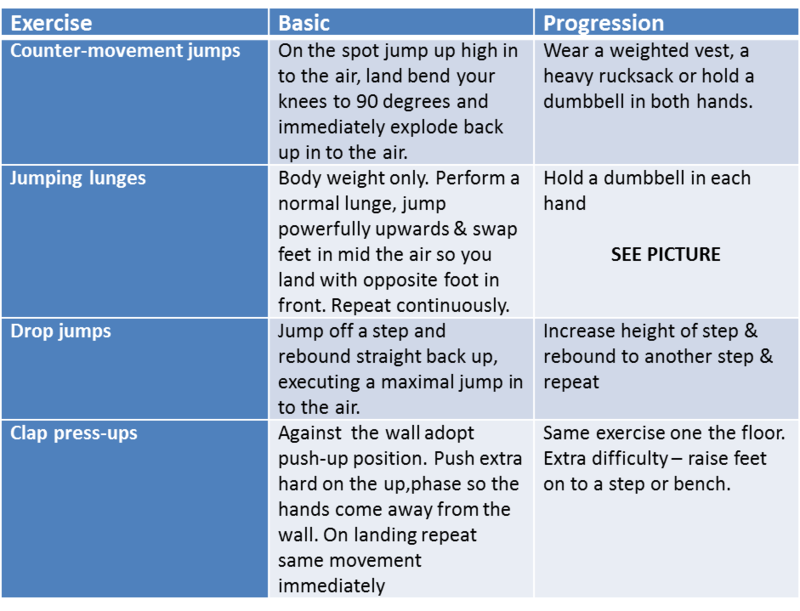 Most movements in sports activities are multi-joint (more than one joint), therefore, I’ve included these examples as they can be applied across many sports and exercise settings. As with strength training, you’re trying to recruit from the fast twitch motor unit pool, and if you remember, they tire rather quickly. The amount of rest you need will vary according to how intensely and long you’re working form, however, aim for at least 2 minutes rest between sets. Need some help? Get in touch with and post your question here. Or visit the programmes and one-to-one page to get started.